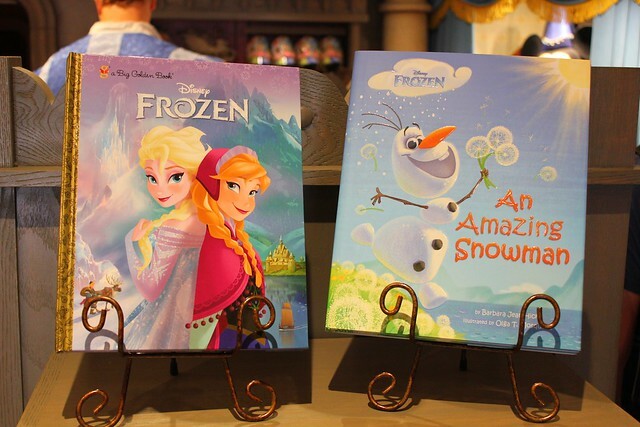 Beginning today, Easter Sunday, Walt Disney World guests no longer have to wait hours upon hours to meet the popular characters Anna and Elsa from Disney’s hit film “Frozen” – if they plan ahead. From the moment the park opened today, it was clear that the “Frozen” stars will be the Magic Kingdom’s most popular attraction for the foreseeable future, likely drawing even more attention than the nearby Seven Dwarfs Mine Train, nearly ready to open. A 3-hour wait formed nearly instantaneously when the park opened, adding another hour to that time by 1pm. But those who booked a FastPass+ reservation when they became available 60 days ago (30 days ago for annual passholders), could be admitted to see Anna and Elsa with little to no wait. 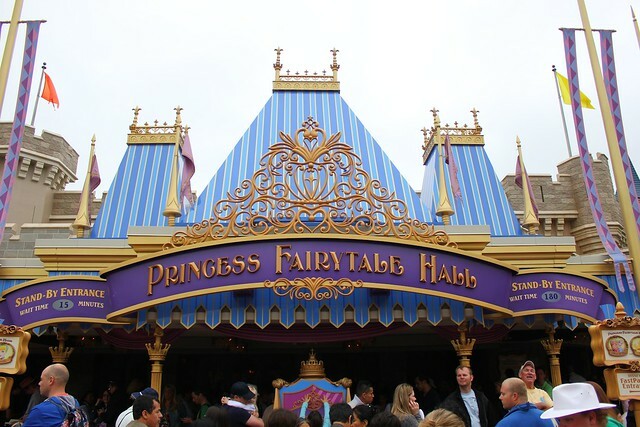 Princess Fairytale Hall has two sides, currently featuring Cinderella and Rapunzel in one plus Anna and Elsa together and a final “visiting Princess” in the last spot. Guests can wait in line for one side or the other, not both. Likewise, FastPass+ reservations must be made separately for each side. 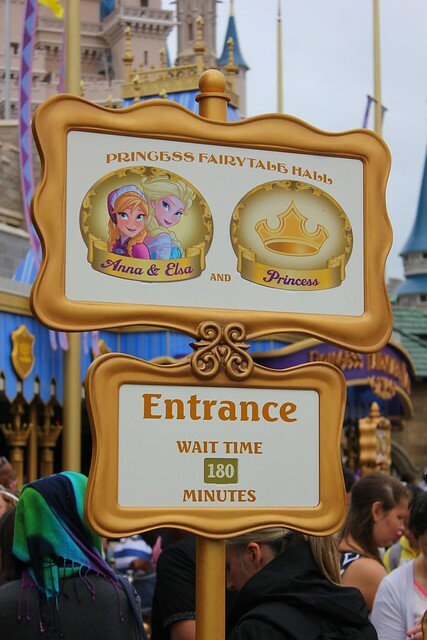 Today it was clear who the popular princesses were, with Cinderella and Rapunzel only having a 15 minute wait while the posted wait time early in the morning for Anna and Elsa was 3 hours. Those who didn’t make FastPass+ reservations when they became available on MyDisneyExperience.com 1-2 months ago or at an in-park kiosk first thing in the morning (with extremely limited availability) had to wait in the standby line. 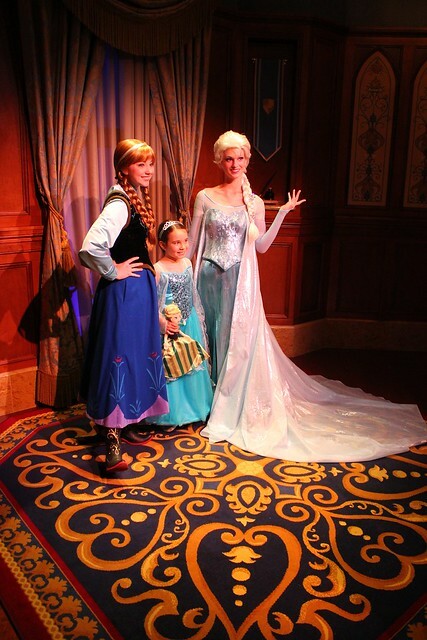 But regardless of how guests got in, everyone was delighted to meet Anna and Elsa inside. There is no “Frozen” backdrop, as Anna and Elsa are simply visiting this royal meeting area, part of the Cinderella Castle courtyard. But the pair seems happy to be there for now, until Disney can build something more permanent back in Epcot’s Norway. However, FastPass+ is a new system and there are definitely still glitches to be worked out, as I discovered today. As it turns out, my concern was valid and there was indeed a problem. I arrived to Princess Fairytale Hall at the Magic Kingdom at around 9:30, waited until my 10:10am FastPass+ time and – along with two friends who also had booked 10:10am times – proceeded to the FastPass+ entrance. But when they scanned their MagicBands and I scanned my annual pass, none worked. 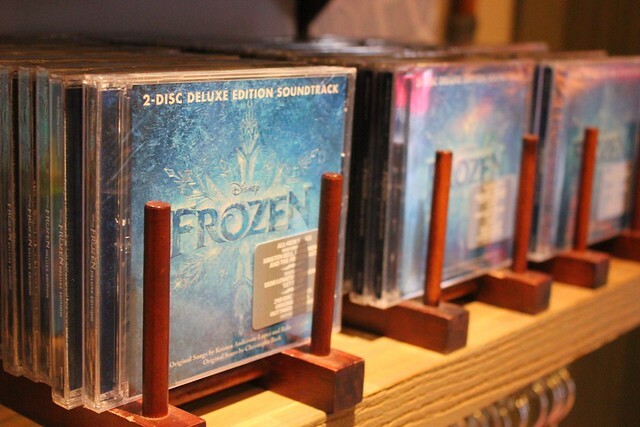 The Cast Members checked the system and said we did not have any FastPass+ bookings for Anna and Elsa this morning. After double and triple checking through a few different ways, the conclusion was the same. So I showed the Cast Member my screenshot, as did my friend who had also thought to do the same. But the response we received was surprising, as the Cast Member said they could not honor the screenshot. When asked why, she replied that we could have changed the photo to show any time or attraction we wanted and that only an active reservation in the My Disney Experience site or app would allow us entry. It’s a valid concern, but we did not appreciate the insinuation that we were trying to game the system with a phony screenshot. We certainly had done nothing of the sort, but obviously could not explain how or why our 30-day-old booking had simply vanished. Now nearly 11am, we were sent to Guest Relations in City Hall at the front of the park, who directed us to Town Square Theater, where FastPass+ Cast Members are stationed. Unfortunately, after a very similar conversation with them and several phone calls and scans later, they were also unable to help. Returning to City Hall, I spoke with a supervisor who made even further efforts to get to the bottom of what happened, taking a photo of my screenshot with her phone, taking my information from my driver’s license, and contacting their IT department with it. After disappearing backstage for a few minutes, I was once again denied, as she told me that IT had absolutely no record of me ever booking a reservation to see Anna and Elsa. It was my word against the computer’s and I had lost. As a last ditch effort to salvage my Easter morning, I showed her the tweet I posted 30 days ago in the hopes that she would see I had indeed made the reservation. It didn’t help. So I decided to head back to Princess Fairytale Hall one more time with the hopes of finding anyone who could assist me. The same Cast Members were still stationed at the meet-and-greet and they confirmed there was still nothing they could do. I had received many apologies throughout the morning and was politely told “no” many times. It was time to give up. 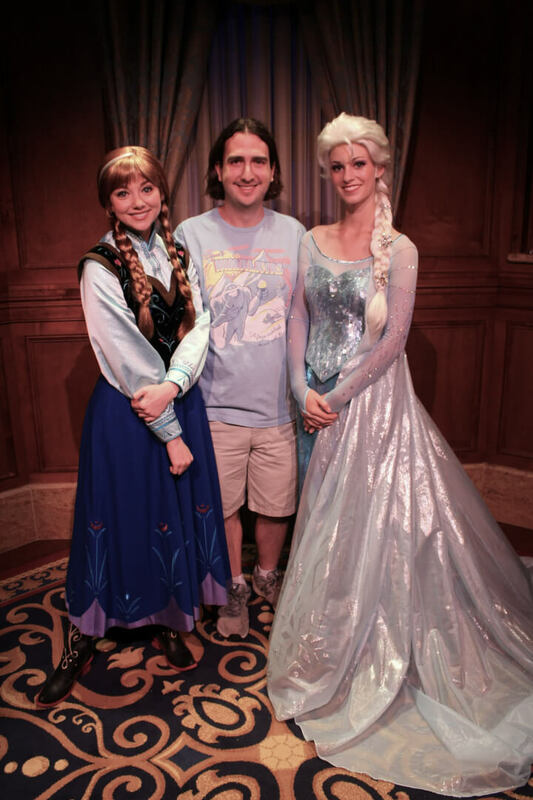 I intended to visit the Magic Kingdom today only to see Anna and Elsa, planning to leave immediately after. Now 11:30am – nearly 1.5 hours after my FastPass+ time that vanished – I decided to ride The Haunted Mansion to make the best of the situation. After an always-excellent trip through my favorite Disney attraction, I was walking toward Main Street to leave the park when my cell phone rang with an unfamiliar local number. On the other end was a man who identified himself as being with Walt Disney World Guest Relations. As it turns out, Disney’s IT staff had been working on the issue since my City Hall visit an hour earlier and discovered there was indeed a technical glitch that caused my FastPass+ reservation to disappear. He’d retrieved my home phone number from my account on MyDisneyExperience.com and called it, after which my wife gave him my cell phone number to reach me. Finally, he offered to set up a new FastPass+ reservation on my account, valid for any attraction in the park – including meeting Anna and Elsa – any time between 12:30pm and 11:30pm today. I thanked him profusely and headed back to Princess Fairytale Hall to wait for my new reservation time. Sure enough, as seen in the video above, everything worked flawlessly this time and I was inside meeting the “Frozen” characters within a couple minutes of my arrival. This is how the system is supposed to work and it would have been a wonderful experience at 10:10am. Even with the glitch, the time I spent wandering the park trying to get it all sorted out was still less than the posted wait time when I arrived in the morning, so it was ultimately a positive result. But the lesson to be learned here is that while FastPass+ is still being tested, particularly with new experiences, all Walt Disney World guests should make sure to check and double-check reservations before visiting the park. Though I was mildly disappointed and rather annoyed that the system had initially failed me today, I would have been far more upset if had been traveling with a little girl whose one dream was to meet Anna and Elsa, only to be denied and repeatedly told to simply enter the 3-4 hour standby line. That’s a tough sell to a girl who’s been looking forward to a meeting like this for several months, after a parent has told them there would be no wait courtesy of Disney’s sparkling new system. Since posting about this earlier today, I’ve received messages from several people who told me that they checked their FastPass+ reservations for Anna and Elsa only to find their bookings had also disappeared. Thankfully, they have enough time to correct it now that Disney’s IT staff is aware of the issue. Looking ahead, it seems Disney’s guests have absolutely no way of proving their reservations if the system has another glitch. Screenshots aren’t enough and there is no paper proof anymore, like under the old FastPass system. FastPass+ system is entirely digital and if anything unexpectedly changes on Disney’s computers, guests can make no case to the contrary short of spending hours hopping between Cast Members, hoping for some help. 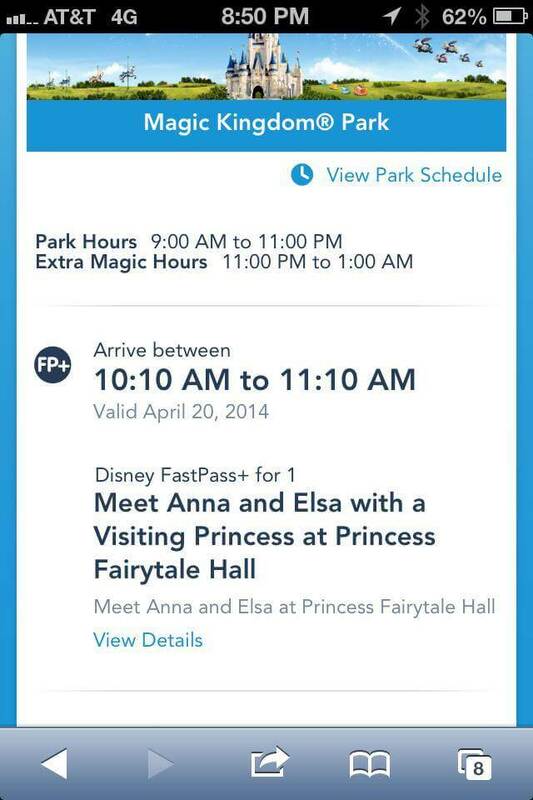 Yes, FastPass+ is still testing. These are the types of bugs that can be expected during any major software rollout. Hopefully today’s bug is quickly being squashed now that Disney is well aware of it. As a personal side note, as I posted to social media this morning about the FastPass+ issues, I received a handful of replies from people who claimed I was using my “clout” as the owner of a popular web site to demand preferential treatment. This is not the case. I never once mentioned my site by name, except when I was asked for my e-mail address by Cast Members to access my account on their system. When I showed the City Hall Cast Member my tweet, I did not mention or emphasize my name or site in any way, simply showing her the content of the message and timestamp to affirm that I had booked the reservation 30 days prior. When I received the unexpected phone call from Guest Relations, I asked how he got my number and why he was calling, just in case it had somehow filtered through Disney’s public relations department, whom I frequently work with when writing stories about them. To the best of my knowledge, PR had nothing to do with the positive outcome. As far as I can tell, it was simply Walt Disney World doing their best to follow up on a poor situation, admitting their fault and making it right. Though it took a couple hours to get fixed, and I was nearly out of the park when it did, I was ultimately happy with the result and even more satisfied that they followed through. The only complaint I am left with is that Cast Members should not accuse guests of forging FastPass+ reservations. While it is entirely possible that someone could do that, it should not be mentioned. A simple “it’s our policy to not accept screenshots” would have sufficed. 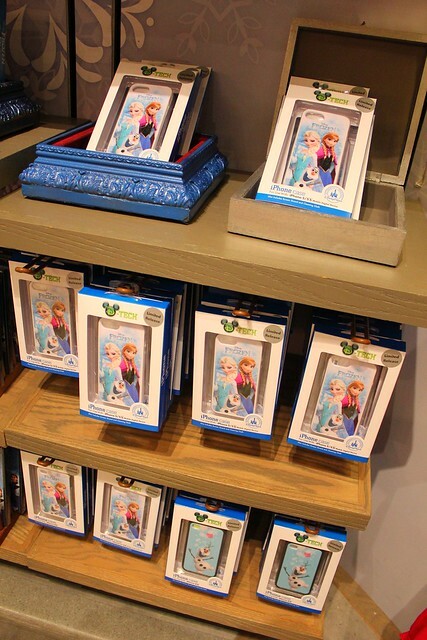 Just in time for the arrival of Anna and Elsa to the park, the Magic Kingdom has stocked up on “Frozen” merchandise in the nearby Sir Mickey’s store, including wigs, books, DVDs, cookies, T-shirts, iPhone cases, and much more. There’s also some beautiful artwork behind the register that shows what “Frozen” would have looked like had it been a 2D hand-drawn film. 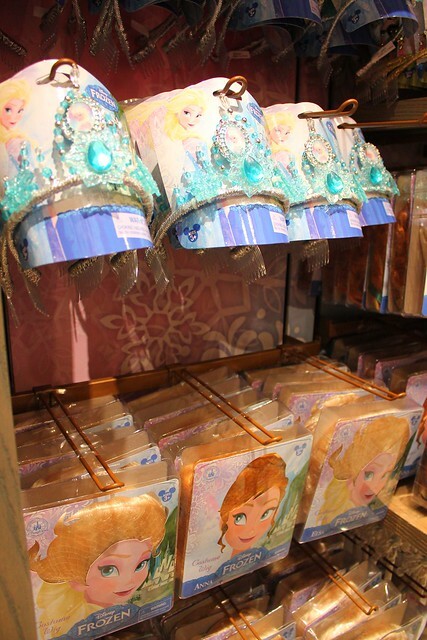 There is some added good that came out of Anna and Elsa moving in to Princess Fairytale Hall. Snow White was formerly meeting there, but now there is no room for her. So instead, she is meeting with guests in Town Square. 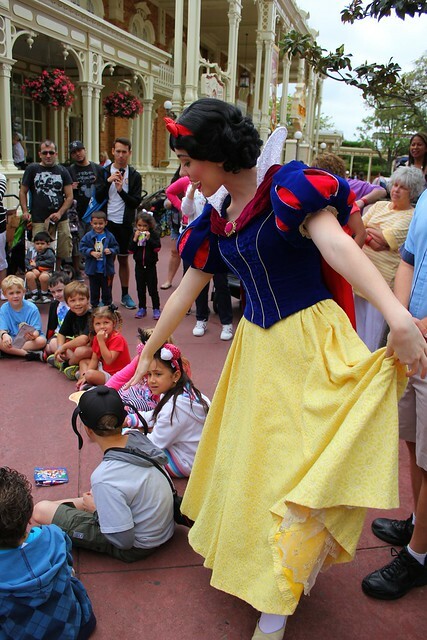 And while the Easter Bunny and Miss Bunny were occupying the meet-and-greet area next to City Hall, Snow White was simply out in the street mingling with guests today, even sitting down to play a game of Duck Duck Goose with some children. 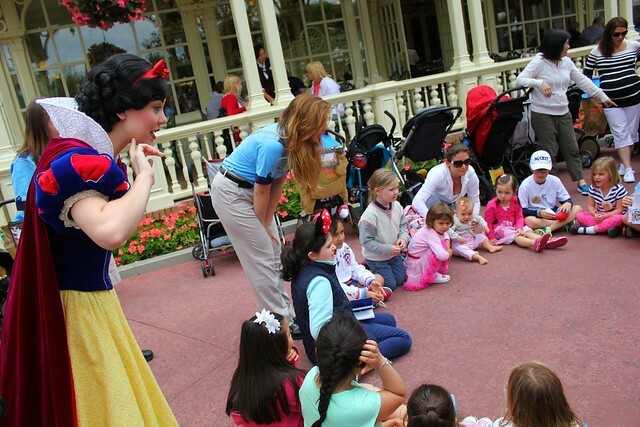 This is the best kind of Disney meet-and-greet – the natural kind that happens unexpectedly in the streets of the park, not hidden behind queues or FastPass+ reservations. Stumbling across Snow White on my way out of the park solidified the smile I had on my face after finally meeting Anna and Elsa. There was Disney magic at work today and though FastPass+ had a meltdown this morning, in the end it was a happy Easter. More reasons to hate the new system. Something NEEDS to be done about the awful thing. Mitchell, I agree that Fastpass+ has some serious issues that need to be addressed, and the whole My Magic+ system has been a money hole that has set the Parks years back in terms of development. However, I can’t logically accept THIS as a reason to hate the new system. This was a glitch. The ages old Fastpass system had glitches. I used to work at MK in Turnstiles (a very short time), and the old ticket system would have glitches now and then. Glitches just happen. The only place that I can sort of agree with you is that this is one of the first cases I’ve heard of “your word vs. the computer” where Disney has sided with the computer. Disney is usually a company that bends over backwards to make sure guests are happy, this was a rather ham-handed “Oh well, you’re screwed” by the cast members. Not so much as a No Strings Attached? I think I have an idea. Fastpass+ reservations should include a unique QR code, generated when the reservation is made. Something that, at the very least, can be scanned and demonstrate it was a legit booking. it’s a glitch that could ruin someones vactaion. Imagine telling your little girls that they will get to meet Anna and Elsa 60 days then when you get to the park your fast pass isn’t recognized. That’s why I told my daughter we’re going to TRY to meet Anna and Elsa, but they’re very very popular and we might not get to see them. “Those who didn’t make FastPass+ reservations when they became available on MyDisneyExperience.com 1-2 months ago or at an in-park kiosk first thing in the morning (with extremely limited availability) had to wait in the standby line.” There is nothing good about that statement. People who decide to go at the last minute to the park have almost no shot at doing it fairly. The old system was simple, you get there early and you get the FP, first come, first serve. A FP is not a rite but a privilege, or atleast that’s the way it has always been. Disney made a huge mistake with this new system. Regular old caffeine free Fastpass hasn’t entirely gone away, has it? I’m not sure, but it seems like you could still do that. Worst to ABSOLUTE worst, you CAN get in the regular line and wait. Disney often overestimates wait times, and the regular line is worked in with the Fastpass line. smaller things you can probably get but bigger things not so much. It makes it very hard for spur of the moment visitors. FP- hasn’t been available for quite some time now. Just the opposite. Snow White had a posted time of 30 minutes and it took 90. Every FP+ person was allowed in. If absolutely no one was walking up the ramp the CM would turn around and would let one standby group go through. I counted 75 FP+ right before I as a solo person was allowed on. It’s the only way to get fast passes. I totally agree, My Magic+ and FP+ is a brilliant service, we used it on our vaction in 2013 whilst it was testing… I do think though that FP+ reservations should be limited to 1 week prior, no longer. This would make it fairer to all involved! Well Disney could NOT have fastpasses at all, or make the privilege only available to those who pay extra for it, like another theme park close by. Do I completely agree with the current incarnation of the fastpass+ system? No. However, Disney has spent TONS of money on this new system and they’re not going to abandon it anytime soon. That means you need to learn to work with it – so if you think you’re just going to drop in – you’re probably not going to be able to utilize fastpasses, you’ll have to wait in the regular line with everybody else who wasn’t able to make a fastpass reservation for that attraction. I see the paid fastpass approach as even less fair. A family trip to Disney is a significant financial investment. The idea that only the families with that much more disposable income get the opportunity to skip to the front of the line makes it feel so much less fair. This way every guest gets a chance to book in advance. It’s true that the spur-of-the-moment visitors don’t get that advance chance to book in advance, but that’s reasonable. If you don’t buy your plane ticket until the day of the flight, would you expect your choice of seats on the plane? The people who booked early got first crack at their seats. Of course, I’m not sure this is an issue with any fastpass attraction other than Anna & Elsa. but the thing is the paid fast pass systems at parks like Universal and Six Flags actually works better since only a very few people end up paying for it. But yeah the best thing to do would be to get rid of all fast passes. That would actually make it more fair and the lines would be significanly shorter for everyone. You state how it isn’t fair that last minute park visitors don’t realistically get a shot at FP+ but then you say that you like the old system where it was first come first serve. A last minute visitor that doesn’t show up early will still be out of luck in the old system if times are all booked. For both systems, planning ahead always pays off. Which totally undermines your first sentence. Yeah, it’s not fair. It’s not a right, it’s a privilege. Which isn’t “fair” either. What seems to have happened is that who benefits from the privilege has changed. Now, the privilege belongs to people staying on Disney property, who get first crack at FP+. Then annual pass holders, then people who show up on the day of without having done any planning. Whether or not that’s fair, you said it yourself: FP isn’t a right, it’s a privilege. 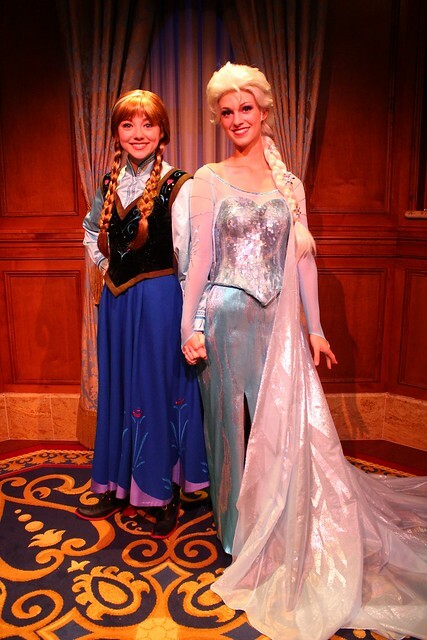 I’m glad you were finally able to meet Anna and Elsa! As a mom traveling to Disney from another country and only being able to visit one park I would have been crushed if this had happened to me. With characters that are so much in demand right now there should be options available. It would be nice to meet all the characters in all the parks. Our budget usually just allows for WDW and only for one day so that limits our chances a lot. Still we are die hard disney fans. The video of Snow White is wonderful. Oh, to be those kids getting to play with her…. I bet that was so magical for all of them! It’s not only a great bit of crowd distraction, and giving Snow more equal-time, it’s perfectly in character, with Snow being more childlike–WDW needs more neutral-territory character fun like the Musical Chairs with Alice at Disneyland. at least the glitch happened to you instead of someone there for just that day from out of state, also a good thing that it happened to you because you can report this on your website and get a quicker response due to your connection with media. the face characters look a little off to me, like they don’t look like sisters, Elsa looks like she is 30 and the hair looks like a cap and Anna just looks off in the face, as a kid you wont pick up this as long as the costume fits witch it does. Thanks so much for posting this! We are coming down in September and as we could not wait with our 1 year old for four hours in December I was very excited to see how this played out. What a terrible thing to hear about the negative vibes on using ur clout. A main reason my husband and I, (both former cast members) love this site is that you always give it from the guests perspective! Thanks for showing Snow White too! I hear they do that at Disneyland a lot and its great to see it here. I wonder if the CMs would have been more accommodating had you been traveling with a little girl, instead of flying solo. 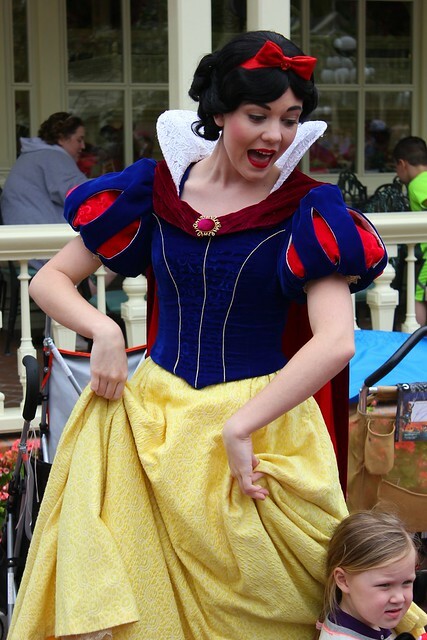 LOVE that Snow White was playing with the kids, what a magical moment! I already hate fast pass plus and I haven’t used it. I hope they go back. How can you hate it, then? In the defense of the cast members who helped you, they told you they couldn’t accept screenshots. You pressed for a reason why. Would, “Because we don’t,” have pacified you? If so, why were not satisfied with your initial answer? Forging fast past times would be ridiculously easy. They were apologetic and polite, but it is not their job to bend the rules for anyone. That’s above their paygrade. Here’s my list I made of five things that I would love to see in theme parks and something that some theme park companies would and could do someday in the future based on my thoughts. 1. I would love if Cedar Fair (the owner of Knott’s Berry Farm) would someday think of building a new theme park in Florida. 2. I would love if Six Flags theme park would someday come to Florida. 3. I love if Universal or SeaWorld would get the attraction rights to an Anime character Hatsune Miku for their parks. And speaking of which by the way, in case you don’t know who is Hatsune Miku, she is a Japanese cartoon character who is pretty much a fictional female teenage pop singer and probably a mascot for a Vocaloid singing voice synthesizer brand developed by Yamaha Corporation in Japan since her debut in 2007 as part of the second Vocaloid line-up. And you don’t understand then here’s a link that you’ll learn what I mean :http://en.wikipedia.org/wiki/Hatsune_Miku. 4. I would love if a new SeaWorld or Busch Gardens would come to Japan. 5. I would love to see if Disney’s Animal Kingdom would includes real bears in the future. I know doubt it and don’t saw that happening, but what’s your opinion on those? I do know who Miku is, and Japanese licensing is a nightmare, please keep to the topic. By the way, what are you talking about by saying “Japanese licensing is a nightmare”? Because Yamaha AND Crypton want money Disney doesn’t want to pay, and they don’t need Disney’s exposure to get it. That’s why a fan can’t get everything he dreams up. Sounds like she way too expensive for theme park companies like Disney and Universal in our country, huh? And it would better if Miku would someday be appeared in Japanese theme parks like either Universal Studios Japan or Tokyo Disneyland, how’s that sound? I know the fact bears lives in North America, Europe, and Asia, but not in Africa. WOW. The blind faith you have in the CMs is almost comical! Gone are the days when people wanted to be CMs. For many it is now just a J.O.B. and they don’t have the same Disney way that most of them did in the past. On one hand they are human beings so I should grant them grace, but on the other hand they accepted a job at Disney World/land, supposedly the “happiest place on Earth” so they need to check their attitudes at the door or find a new job. I have experienced more rude CMs in the last 18 months than I ever have before. 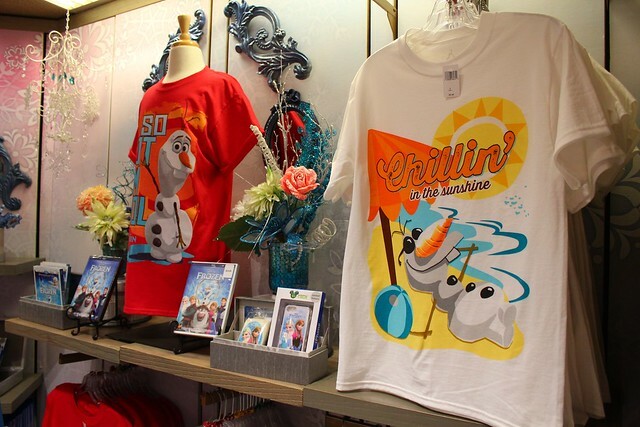 Something has clearly changed and it doesn’t make me want to spend my money on Disney. So, unless you were there I don’t really think you have a right to judge what happened and to insinuate that he used his “clout”, just makes you sound petty and jealous. With that…have a magical day! I do have one question for you when you see the nice ones that do a good job and play there role in the show do you ever think to go to guest relations or a leader and report that they are doing an am amazing job. Sometimes little things like that can make a Cast Members day a little brighter. Sometimes as cast members we get yelled at everything that goes wrong. Example Try working your favorite holiday where your rather be at home with your family, but your stuck at work getting yelled at because the park phased closed and you politely say the park is closed due to capacity. Back in the days when Skipper Ben was contributing, he emphasized that just giving a CM an official Guest Relations pat on the back once in a while does wonders–Not just psychologically, but they’re a little less anonymous with any supervisors who notice them. Don’t shoot the FP+ handlers, they’re doing the best they can. I was in the park yesterday when I heard a manager tell a group “Anyone could make up a screenshot”. I was floored, but after reading this article, it now seems to be the party line. I’ve also noticed that in the past couple weeks, the parks have been paranoid with people potentially gaming the system. I really miss the old fast pass. Not only was it more fair when it came to first come first serve but u get better attractions in the end. Ex if i get toy story mania i can’t get fantasia. Also i use to have annual passes. A few times we would leave early cause we lost track of time or my kids were tired so we would wanna leave. So we would do kinda like a pay it forward. We saw a family at the end of the line who needed those amount of passes. We would just give it to them to make their time magical cause now something cool and random just happen to them. Made my day making some kids happy just giving them those passes. But besides that the glitches scare me as well. Yeesh they both look like two men in drag! Three hours to wait for that?! No thanks! First, get your eyes examined. Then, get your head examined. That would be a better use of your precious time. 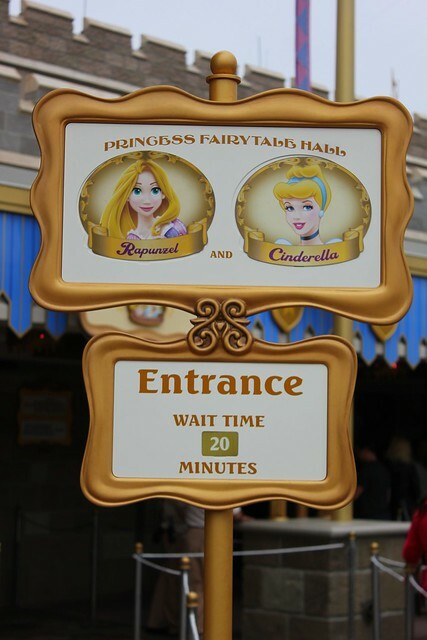 Great article – very thorough about your personal experience, but informative to the situation of FastPass+. I prefer these kinds of articles to just the normal “press release” articles. Personal touches are great! Ricky, great post. The thing I am most impressed about is the way Disney not only got to the bottom of it but went out of their way to find you. I’ll be the first to admit I don’t like being the guinea pigs for FP+, but obviously the cast members are struggling with it as well. To have a team on standby, on a holiday and Sunday no less, is admirable. Several times, I have had a customer service failure in the Park, and every time castmembers have gone “above and beyond” to make it right. It’s the reason I keep coming back. Mistakes are going to happen; it’s what you do after the mistake that counts. And Disney is absolutely one of the best companies I have found to right a wrong. They are not perfect, but I haven’t found anyone any better. The problem with FP+ is you have no way of proving you have a reservation when this happens. For 7 of our 9 park days our FP+ selections that I booked weeks before and never altered were not there when we tried to use them. I had to pull out the computer print out I made before we left home of all our FP+ selections because I feared this sort of thing. CMs also used the fraudulent word with me. I also brought with me proof of our park tickets, etc. which came in handy when we tried entering the park one day and they said we had no tickets. First day had to use the back up card to use our meal plan as they deactivated our bands for that. Had to get that fixed too. We really do NOT like this new system. No way to prove any of what you paid thousands for. We go every year and last trip was by far our worst most stressful experience. Just our experience with it. The last time I was at WDW was when I was 15 in 2001. I am going in November for my honeymoon. I remember really hating the old fast pass system as a kid because we had to run around and get fast passes to come back later. It could really split up our family. I would hate to have to do that on my honeymoon so I am very happy WDW has a new method. Yes it requires planning. But I’m fine with that. Robyn — I think you’ll love it. I had a similar reaction as what you described. I hated having to run to kiosks to collect fast passes for everyone in my group, then constantly watching the clock so I knew when to go get more. All the while keeping up with everyone’s key cards and slips of paper. In that context, the new system is a breeze and ultra convenient. I am very nervous about the “disappearing” fast passes on our upcoming trip. 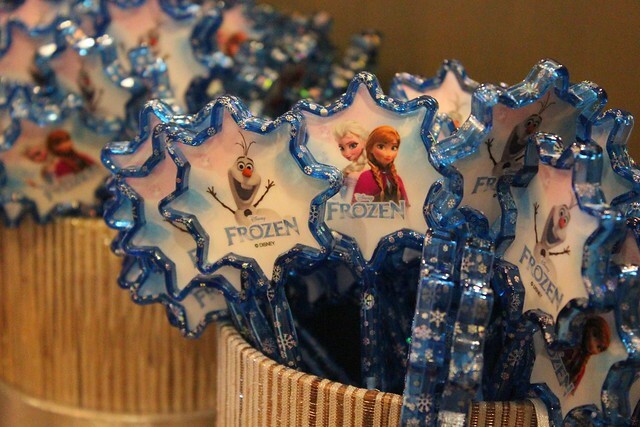 Only for Anna and Elsa – everything else, whatever happens, happens, but A & E are a planned highlight of the trip. I have already experienced the disappearing fastpasses once and spent an hour with IT getting them back. I do not want to talk to IT for an hour International Long Distance, and I do not want to spend over an hour of my time with Guest Services. This is not a more relaxing planning experience, it is much more stressful! 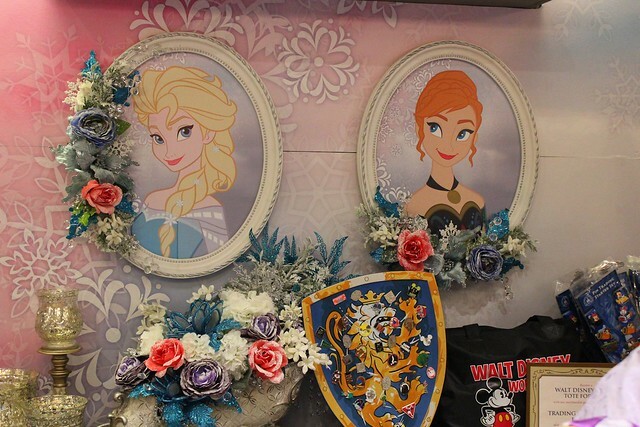 Princess fairytale hall is the permanent location for anna and elsa, they will not be going back to Norway as they are not from Norway, Disney has even said they are not norwegian, just norway inspired landscapes. Plus Norway’s pavilion was not able to hold the lines, MK can handle the lines. As for the fast pass bookings, you can always go to the FP+ kiosks before heading over to give evidence that it went through, and no screenshots will not be taken as proof as many people try to cheat the system by making fast passes, then screen shoting, then canceling to make more fast passes. If I bring along a printout of all of my FP+ reservations as they are listed in MDE, would that work as proof in case if a glitch? Easy enough to add a printout to the backpack. I brought a print out of all our FP+ selections on our trip. It did not help. That is when the CM used the “fraudulent” word and pulled us out of line. They have to see it on their computer screen to believe you. But, I would still recommend bringing a copy just in case. Any system that allows you no evidence or proof of a reservation is a system that is flawed IMHO. I gotta say, I just spent 8 days in the parks, during spring break the week before Easter, and FP+ and MM+ worked pretty flawlessly for our family. The glitch you described above was pretty awful, but the real takeaway for me is the way they worked to resolve it. It confirms for me that the customer service that WDW provides is what really separates them. We had a frustrating snafu with our dining plan, and although I initially was given conflicting answers and various kinds of “no” from CMs as we tried to resolve it, ultimately they took care of us and made sure we were satisfied with the outcome. That’s what matters to me. Mistakes will happen, but Disney almost always goes the extra mile to fix it. As an annual passholder, all I had to do was bring my annual pass, to get into the park. Now I need to bring my wristband, my golden discount card for parking, and my ID for them to check. You still can’t link your credit card info to the wristband (if you are annual pass). I bring more things now, than what I use too. And when dealing with “guest relations” I think Disney has REALLY gone down hill. Like, when trying to book BOMA the other day, and the cast member, didn’t know they had a restaurant called “Boma”. I LOVE Disney. But that Boy Wizard, really starts to look good, after awhile. If you don’t want to use the magic band and card etc then just use your annual pass card. You don’t have to use a magic band if you don’t want to. If you do want the magic band but hate the card, leave it in the car when you park if you aren’t planning on using discounts in the park. actually RFID tech is already outdated technology. Here’s the thing its no longer in testing phase. When they completely removed the old system and made this the only way to do it its no longer testing. It’s live. They could have taken more time to work out the bugs before it ever went live but they decided not to do that. They are now stuck with a technology that is severiely limmiting. I think good prof of making the reservation could be when you make your Fasspass+ make a video on a nother smart phone of you making your reservation to show to the cast member if it’s not working. They can’t say no to that. I do think disney should do more of the natural meet and greats like with Snow White, another great way could be Gaston could walk around the tavern and shop instead of people just waiting in a line out side next to the fountain. Isn’t that what a theme park is all about, seeing characters in their world, cause they last time I looked characters don’t just stand their in a movie while people get in a line to tell them about things, they walk around. I loved the muppet mobile labs cause they had a guest to guest interaction in their natural habitat. Stuff like that doesn’t work. Someone can easily make a video of themselves making a reservation and then changing it and re-record it making another reservation. I think the REAL problem here is that Disney only has ONE meet and greet with the most popular characters in the park. Mickey Mouse is everywhere, yet Anna and Elsa, who still generate tons of $$$ to the park, can only be visited at the MK and only until 5pm. Put them in ALL of the parks and have them there all day. Or continue to have disappointed guests on a daily basis. This is the worst kind of scam you can come across. consolidation and how it could be applied to ykur situation. I’m really surprised at the initial response. With Disney’s reputation for customer service, and the reality that this is a new system, you’d think they’d err on the side of the customer to preserve their experience. Now, if they began to be inundated with people trying to scam them with fake screenshots, I’d understand. But, to let a few scammers slip through in order to protect the experience of people who made legitimate reservations seems like the smarter play from a customer service perspective. It would have been a major problem for me, because since I’m a foreigner, I don’t take my phone to the park. How would they have contacted me? I noticed in the article that you said you did not want to “upgrade” to iOS 7. I am with you 100%. I was accidentally tricked into upgrading based on some misinformation provided by an Apple Genius. Unfortunately there was no way to downgrade except buying a used iOS 6 iPhone on eBay. I am ashamed by Apple’s design choices in iOS 7 because there is no way that I could enjoy using my phone given their changes in the design. I am still able to run an earlier version of the My Disney Experience app that works with iOS 6. If you are interested I can try to send you the app package file for the version that I am running. Disney’s new Fastpass+ its actually brilliant compared to the old Fastpass system. You are guaranteed 3 Fastpasses, where you can customize the times to your convenience. THREE Fastpasses! Compared to the old system where you had to walk to the ride to be told to come back 5 hours from the time you were at the ride to begin with, there was no changing the time of the ride to accommodate your plans for the day. If you had the fastpass at 6:30 and dinner reservations at 6:30, well it was either dinner or your ride. Now you can pick and choose the times. Oh did I forget to mention that the old system made you wait 2 hours in between your Fastpass selections? So you had to pick your Fastpasses wisely because you couldn’t make another decision for 2 hours. Where your next time would end up being for 9:00pm when its 1:00 in the after noon. Now you are guaranteed 3 right off the bat. Then after that they just implemented another feature to it, where once you complete your original 3 Fastpass+es, you can continuously come back and fastpass one ride, RIGHT AFTER EACH OTHER! Which means, you want to go on Space Mountain and you have your Fastpass+ for 1:00. You can go on the ride at 1:00 and at 1:05 when you are off, you can Fastpass+ whatever ride of your choosing. AND YOU CAN FASTPASS+ THE PARADE AND FIREWORKS NOW! WITH VIP SEATING! AND did I forget to mention that you can do it on your phone with the My Disney Experience App? So you don’t have to wait until you get to the park. And even if you do buy your tickets in the morning spur the moment, they will still be able to customize your Fastpass+. Disney has spent billions of dollars in this update. It is not going anywhere. They are still working out kinks and glitches. Its technology, it will never be perfect. It will experience problems, especially at the beginning. Oh and by the way this is a COMPLETELY FREE SERVICE Disney provides to its guests. Everywhere else, you pay for it. It might take getting some used to, but doesn’t every change that happens anywhere take some getting used to and learning. 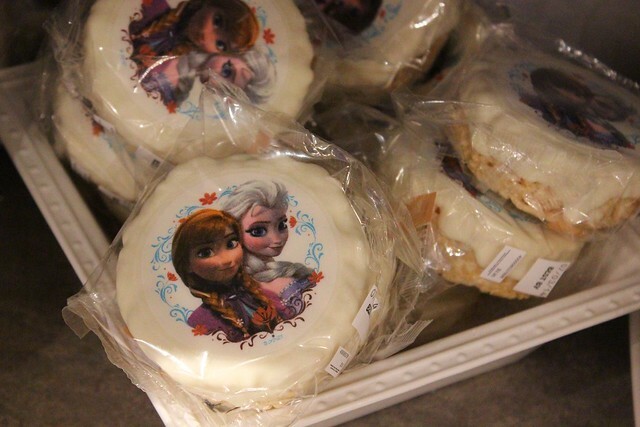 I thought Anna and Elsa looked a bit…. too old. Not one child around me in line was particularly excited once they got close. 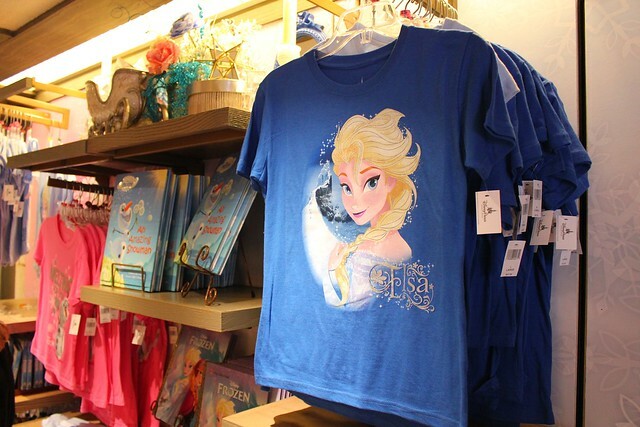 In fact, one girl walked away saying, “Elsa isn’t pretty like in the movie. She looks like our babysitter.” Which, I was hoping none of the other children heard. But, they didn’t need to. Almost all the kids in line were whispering about it. Disney probably needs to recast for that part. We were first in line to see Anna and Elsa. FastPass users sometimes wait an hour or more. How did we do it? We booked a breakfast at the Castle before the park opened and got in line early to get our table. 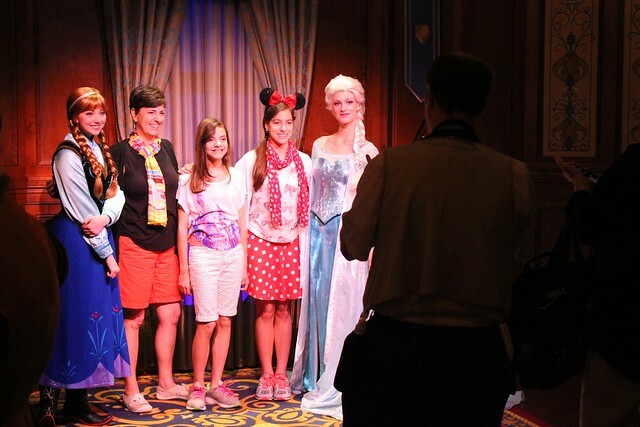 After pictures with the four princesses we went downstairs and got in a line near the Elsa/Anna location. It’s roped off and at 9am they parade you around the carousel and into the building. 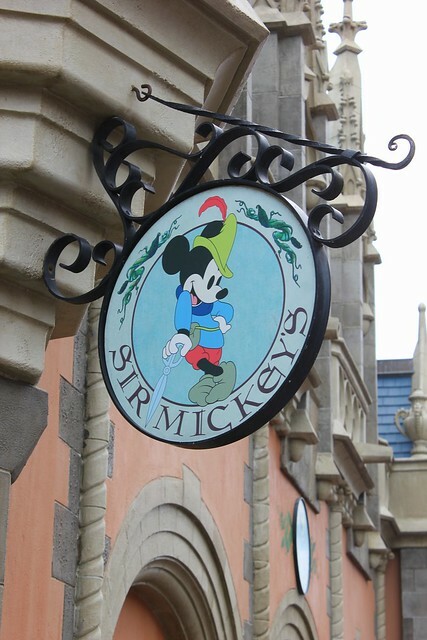 We were very lucky and without that good fortune, the 4-5 hour wait (June 13th) would have been unreasonable. Did you make this website yourselff or did you hire someone to do it for you? Pllz answer back as I’m looking to design my own bloog and would like to find out wwhere u got this from. celebrate my body. It is obvious that production will be very expensive. began to circulate the Internet and also caused a lot of controversy. This story was mmy great help to my homework for English course. I was ready. Thank you for you lesson how to write storytelling. This was my first successful work with which i wwon my teacher’s attention. BOM DIA! ESTOU A PROCURA DE UMA FRANQUEADORA DE AGENCIA DE TURISMO. Hey there just wanted to give you a quick heads up. The text in your content seem to be runmning off the screen in Safari. thought I’d post tto let you know. The design look great though! 7th who Choir Girls Princess All the They Her friends Girls Turn ? to Princess Show White and Princess Merida Brave Her friends Girls All ? How are you. I’ m fine ? Disney Characters Meeting Nicholas Gist Chip and Dale ? His friends Mickey Mouse . with They All the They his friends Characters ? Staff Mrs. Erica Mrs. Mikki Staff CSDB ? to Princess Show White Girls . where can i do it please heelp out.